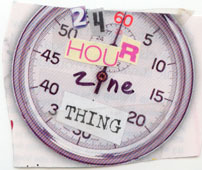 Today marks Day 1 of the 2010 24 Hour Zine Thing! To get your creative juices flowing and help with all the bumps in the road throughout the month, more about we will post helpful tips, interviews, and reviews of zines completed for past 24 Hour Zine Thing challenges. When I first received Keetâ€™s zine in the mail, I remember thinking the splattered ink design on the envelope was pretty cool. 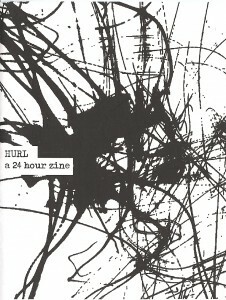 The cover of Keetâ€™s zine Hurl is no different. Completely handwritten in very legible cursive, this zine is cute and sweet. 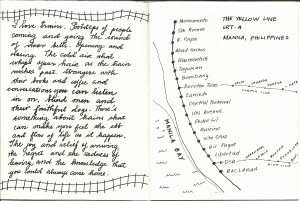 Keet writes about her love for trains, listing off of the random details that have caused this love to develop, and includes little drawing of train lines in the Philippines and Canada. Further into the zine, Keet shares her first zine experience: an introduction to zines and radical feminism through Jawbreaker, a zine published in the Philippines by Claire Villacorta. She recalls the feelings conjured by this experience, as well as personal regret for not becoming involved in the zine community sooner. This zine closes with a letter addressed to â€œJoâ€, which deals with a sense of regret and loss, but takes a positive turn in the end. A simple zine with plenty of text, this zine is a treat.